Note: – Instead of using Workflow Rules you can use Process builder. I will suggest you to replace Workflow Rule 2 with Process Builder. In Salesforce Chatter Group represent a group of users. It’s a great way to boost collaboration in your organization. You can add unlimited members to Chatter Group, but a user can join maximum of 100 Groups. If Chatter Group is set to Private then you have to request to join and Salesforce will send an email to all group Owners and managers. 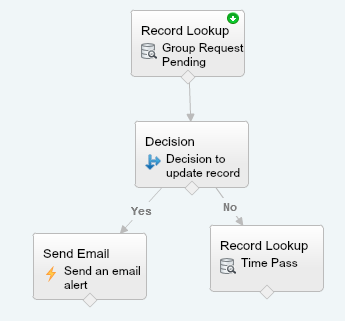 What if the Group owner’s or managers forgot to take action, Salesforce never sends a reminder email. 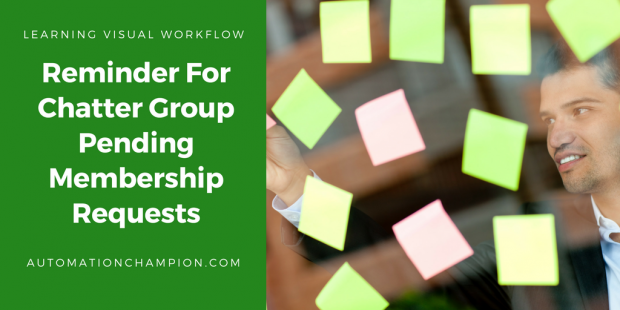 Higher management at Universal Container wants to a develop an automated process, so it will send email reminders to private Chatter Group (Group name: – Chatter Internal) owners or managers unless and until no request are pending to join the Chatter Group. We will create separate record for each Private Group. We will use two workflows to fire Flow Trigger for every hour (i.e. one hour) . workflow1 will contain one time-dependent action (every hour) i.e. to set Fire flag True. As soon as Fire flag set to True it will trigger another workflow2 and this is responsible to fire our Flow Trigger and set Fire flag to False. Note: – We can’t use Flow Trigger (Pilot) with time-based Workflow. That’s why I am using two workflows. 3) Create Three text type variable ChatterGroupID, OwnerEmailaddress and PendingRecordID (to pass Chatter Group ID, Email address to send an email alert and Pending record ID). Body= There is some request pending for your approval. 8) Save the flow with the name ( Auto reminder email) and Close the canvas. 2) To check time-dependent workflow queue Follow the path, Click on Name | Setup | Administration Setup | Monitoring | Time–Based Workflow and search the queue. Can you explain the ‘Email send static action you reference in step #6? I don’t see this option in Flow Designer and I can’t find any other documentation elsewhere online. Thanks!